The track traverses the crest of the vegetated dunes of Milford Creek. The waters of this creek are particularly dark and the ford at this creek can appear much deeper than it actually is. 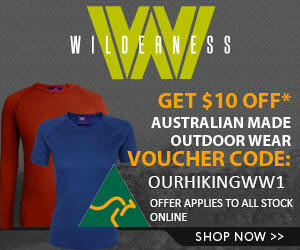 For this reason we decided to take the alternate route and managed to get lost in the bush for several hours. When we emerged from the bush we were back at the top of a steep set of steps that led to Milford Creek. We crossed the creek with ease and continued along the beach at times it some so windy it was difficult to keep walking. 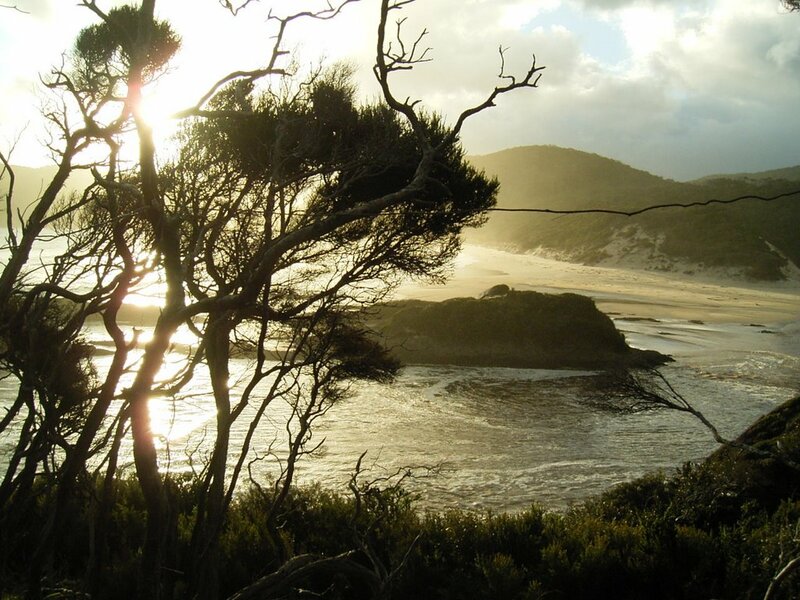 At the end of Prion Beach we climbed the wooden steps up to leave the beach and continued through light bush on an open track. We stopped on Rocky Plains, in drizzling rain for something to eat. Again there was lots of mud to go around or simply through, depending on how deep. Frank lost the chest strap from his pack following a fall as he helped me ascend a particularly steep muddy step. 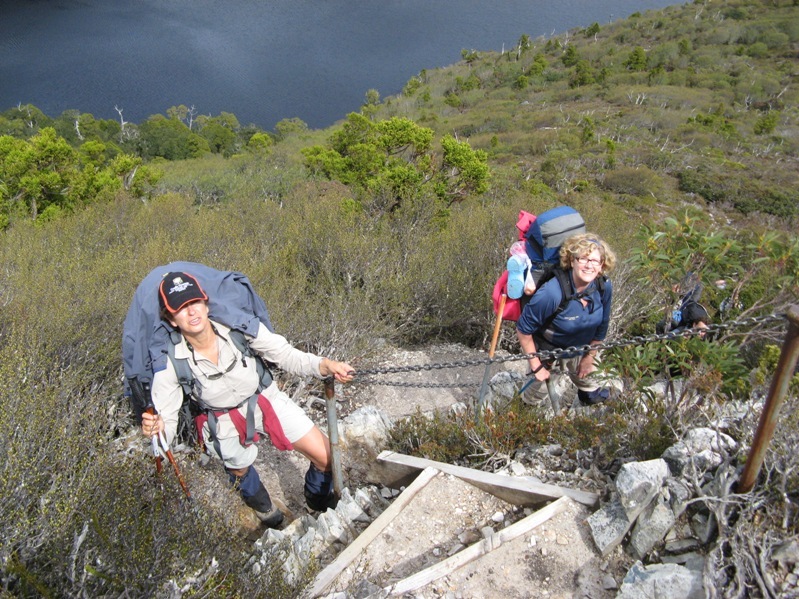 The track then climbs through spectacular mixed forest before descending to Surprise Bay. 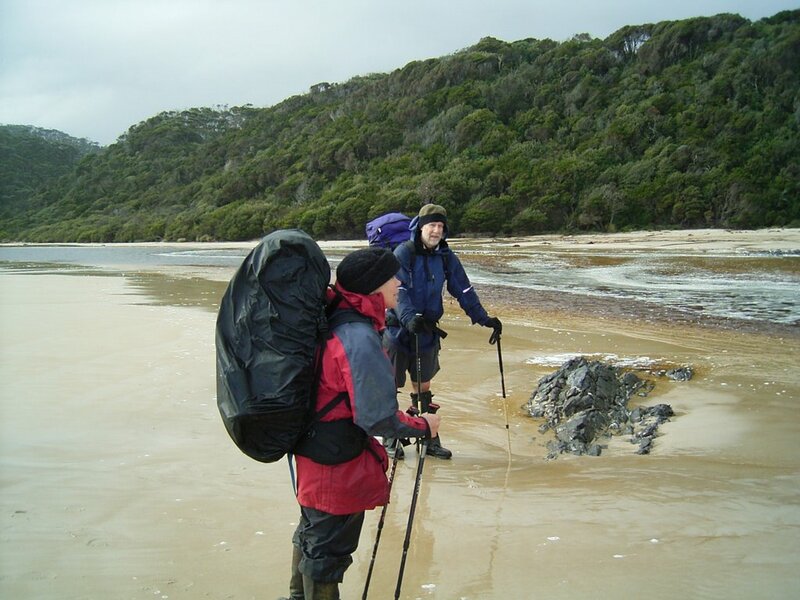 A pleasant walk along the beach is followed by another creek crossing and a short but steep climb up to the campsite. Sue and John (at left) are ready to cross the last river for the day. It was knee deep and very strong flowing. We crossed it together as the last thing we wanted at that time of the day was to get wetter! Water was quite easily found from the beach but the campsite was a short , sharp climb up a set of steps. The rain had stopped and following an early dinner of toasted flat bread sandwiches we were able to sit and watch the sea until it got too cold and dark to do so. This was a great camp site, with spectacular views. A fire place was also provided, which seemed strange in a Fuel Stove Only area. We were in bed early (as usual) because the next day was expected to be long.